Your audiences will be flummoxed in the best way by this action-packed frenzy of bits and pieces of colorful tissue flying in all directions leaving behind a lady's hat in a stunning five-color floral décor and set off with BERGSTROM'S BOUNTIFUL BLOSSOM. What woman wouldn't be proud to wear your crafty creation for the rest of the evening? 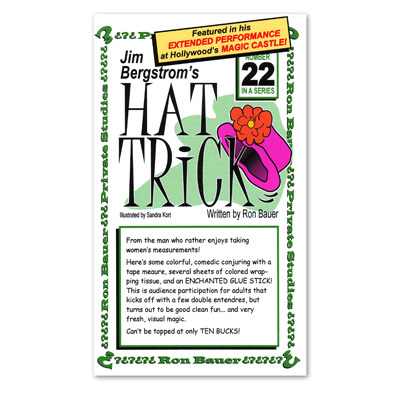 The Hat Trick is now available with detailed instructions and a complete, annotated performance script. You get all the gags and bits of business Jim has used in thousands of shows for first class audiences from Grosse Pointe to Chicago to Hollywood. Use any of several brands of ART TISSUE and GLUE STICKS plus an inexpensive Seamstress' Tape Measure.